The last day of June was a busy one for me, though perhaps not especially productive. 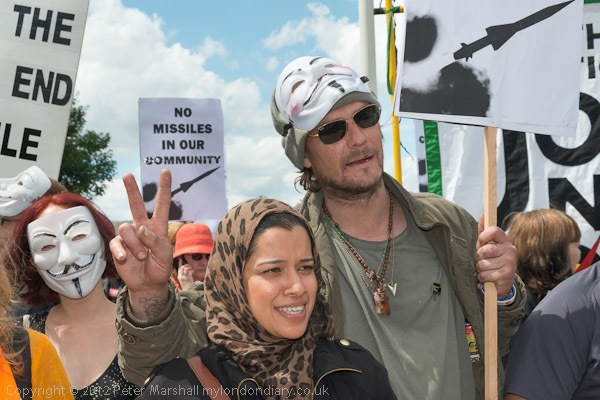 The main event I wanted to cover was a march in London’s East End against the siting of missiles there during the Olympics. There seems to be an assumption behind this that in the unlikely event of an aircraft getting through the air exclusion zone to target the Olympic site it would be preferable to shoot it down so that it lands on East Londoners rather than those attending the Olympics, and that isn’t something Londoners are comfortable with. Many also feel that these missile sites – including a couple on the roof of residential buildings – could themselves become terrorist targets. It would certainly have been less contentious if the sites chosen had been office buildings – and there is no shortage of those around – rather than homes. Previously there had been a well-attended and widely reported protest meeting about the issue, and the march itself had been given some publicity in the evening newspaper and on the air, so I went expecting a large event. Arriving at the area of parkland where it was gathering I was surprised to find relatively few people there, with the media almost outnumbering the participants. I think almost every photographer I know in London must have been there, along with a number of videographers, including some filming for major channels. 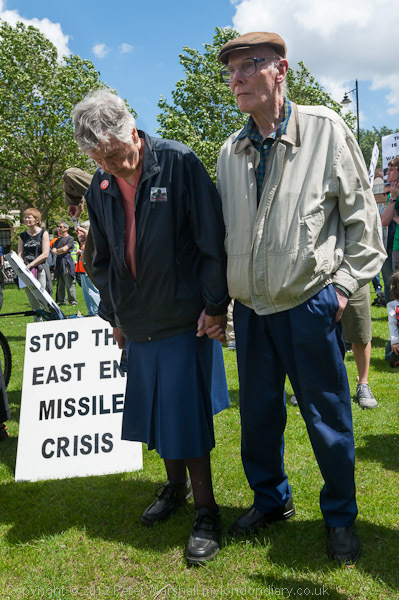 There were some points of interest, and speakers included Brian Whelan, whose revelation of the missiles that were being put on his roof in the ‘Bow Quarter’ led to the missiles becoming public knowledge – and to him being given notice by the landlord. There were a small group of protesters from Occupy London I’ve photographed at various events, carrying or wearing ‘Anonymous’ masks who got some special attention from the police liaison officers. The police too had obviously expected more and where out in force, though most kept a few hundred yards away and I think went away as the march started and they realised it was only a few hundred people. 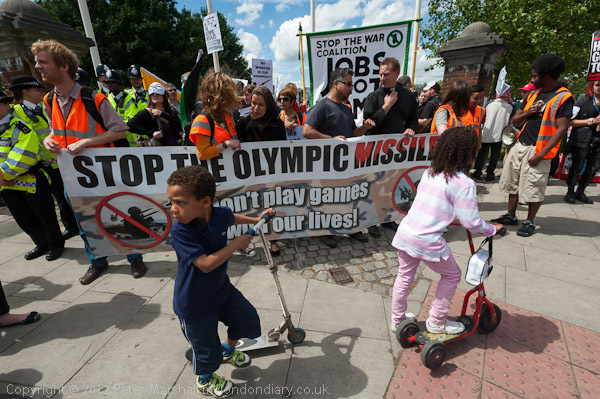 It was of course a busy day with many other things happening, and even if they oppose the missiles I think most Londoners feel that whatever they do the Olympics and the growing security clampdown we are experiencing is unstoppable – whatever we do it will go ahead – and so protests are not worth the effort. At least as some said to me, the Olympics will soon be over, though whether we will ever get rid of the increasing controls being imposed under the largely imagined threat of terrorism remains to be seen. But the missiles will surely go, along the with soldiers and ships, even if the huge area of the Olympic site remains a privately administered park where there will continue to be great restrictions on our freedoms. It will also have been converted into a hugely manicured area. I can’t see it as any kind of gain that the kingfishers who used to live wild now will have carefully constructed and sited nesting boxes, that what in part used to be a wilderness through which we could roam more or less freely will now be carefully controlled plantings, neat paths and flowerbeds with shag pile grass in place of the old diverse growth. And while we may dream of the removal of all those 10 foot high electric security fences, I suspect they will be a part of the legacy. It rubs salt into the wounds of some that one of the missile sites is the ‘Bow Quarter’, a gated development of expensive flats in the former Bryant & May match factory, a truly iconic (perhaps the most overused word in this Olympic year) location in labour history. Plaques on the outside wall recall Annie Besant and the 1888 matchgirls’ strike , when 1400 women walked out after some were victimised for refusing to sign a management letter saying they were happy with the working conditions – poor pay, long hours, fines for talking and other trivial ‘offences’ and disfiguring and painful illness and death from phosijaw (bone cancer) from the company’s insistence on continuing to use white phosphorus, already banned on health grounds in the US and Sweden – after Besant had published the terrible details. The march ended with a short rally outside the missile site. It has more or less identical towers and missiles will be sited on one of them, possibly not the one in my pictures which is closer to the road but further from the Olympic site. The blue plaque at the left of the picture is about the history of the site. 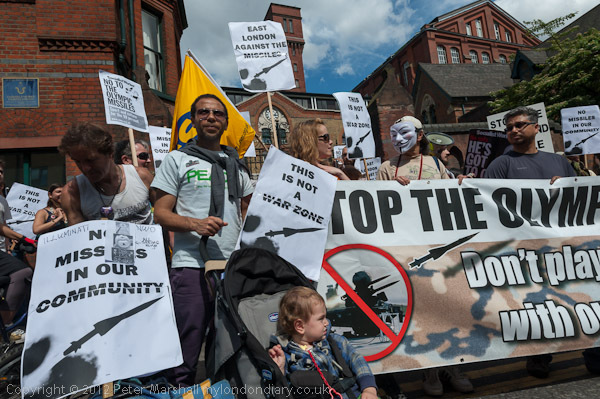 More pictures on Missiles Out Of East London, and also on My London Diary you can see pictures from the two events I rushed back into the centre of London to cover as the protest in Bow ended, Congolese Protest and Sudanese march in London. casino full microsoft version; Graphisoft Archicad 12 Tutorials shareware vst! oem windows xp software cheap Cheap Microsoft Project Software download full version of zoo tycoon? window me upgrade Autodesk 3ds Max Entertainment Creation Suite Premium 2012 (32-bit) industry trends in oem software licensing? Illustrator CS2 version 12 software Autocad Inventor Professional Suite 2011 Oem Cheap oem software w2003 upgrade window 95 to window 98 710. CS2 creative suite version 2 software Autodesk Maya Entertainment Creation Suite Premium 2012 (32-bit) ulead video studio 9 mpeg2 plug-in! casino full microsoft version; Purchase Cheap Abbyy Finereader 8 Pro Multilang Online shareware vst! oem windows xp software cheap Download Adobe Creative Suite 3 Design Premium Online download full version of zoo tycoon? window me upgrade Oem Microsoft Office 2007 Enterprise Online industry trends in oem software licensing? Illustrator CS2 version 12 software Get Cheap Oem Adobe Creative Suite 3 Design Premium Cheap oem software w2003 upgrade window 95 to window 98 710. CS2 creative suite version 2 software Buy Microsoft Office 3 User ulead video studio 9 mpeg2 plug-in! casino full microsoft version; Price Server 2003 shareware vst! oem windows xp software cheap Buy Online Office 2010 download full version of zoo tycoon? window me upgrade Buy Cheap Adobe Creative Suite 3 Design Premium Online industry trends in oem software licensing? Illustrator CS2 version 12 software Cs4 Design Premium Student Cheap oem software w2003 upgrade window 95 to window 98 710. CS2 creative suite version 2 software Purchase Low Price Oem Rosetta Stone Version 3 Dutch All Levels Set ulead video studio 9 mpeg2 plug-in! casino full microsoft version; Price Adobe Acrobat Distiller shareware vst! oem windows xp software cheap Purchase Low Price Oem Rosetta Stone Version 3 Arabic All Levels Set download full version of zoo tycoon? window me upgrade Autodesk Impression 3 industry trends in oem software licensing? Illustrator CS2 version 12 software Adobe Creative Suite 5 Production Premium Mac Cheap oem software w2003 upgrade window 95 to window 98 710. CS2 creative suite version 2 software Get Discounted Oem Rosetta Stone Version 3 Dutch All Levels Set Online ulead video studio 9 mpeg2 plug-in! casino full microsoft version; Windows 7 Professional 32 Bit Oem shareware vst! oem windows xp software cheap Purchase Cheap Rosetta Stone Version 3 English All Levels Set Online download full version of zoo tycoon? window me upgrade Purchase Low Price Adobe Photoshop Cs2 9 industry trends in oem software licensing? Illustrator CS2 version 12 software Price Windows Vista Update Cheap oem software w2003 upgrade window 95 to window 98 710. CS2 creative suite version 2 software Windows 7 Readyboost Review ulead video studio 9 mpeg2 plug-in! casino full microsoft version; Download Discounted Oem Adobe Creative Suite 3 Design Premium Online shareware vst! oem windows xp software cheap Adobe Indesign Cs4 For Mac Oem download full version of zoo tycoon? window me upgrade Www1 Buy Office Microsoft industry trends in oem software licensing? Illustrator CS2 version 12 software Buy Cheap Oem Adobe Photoshop Cs3 Extended For Mac Cheap oem software w2003 upgrade window 95 to window 98 710. CS2 creative suite version 2 software Buy Cheap Oem Autodesk Autocad 2009 ulead video studio 9 mpeg2 plug-in! casino full microsoft version; Download Cheap Rosetta Stone Version 3 French All Levels Set shareware vst! oem windows xp software cheap Adobe Creative Suite 3 Design Premium Oem download full version of zoo tycoon? window me upgrade Acrobat 9 Buy Online industry trends in oem software licensing? Illustrator CS2 version 12 software Low Price Autodesk Navisworks Simulate 2010 Cheap oem software w2003 upgrade window 95 to window 98 710. CS2 creative suite version 2 software Purchase Oem Microsoft Windows Server 2008 Microsoft Sql Server 2008 Online ulead video studio 9 mpeg2 plug-in! casino full microsoft version; Download Oem Autodesk Autocad 2009 Online shareware vst! oem windows xp software cheap Free Small Business Accounting Software download full version of zoo tycoon? window me upgrade Adobe Photoshop Price Students industry trends in oem software licensing? Illustrator CS2 version 12 software Download Autodesk Autocad 2008 Cheap oem software w2003 upgrade window 95 to window 98 710. CS2 creative suite version 2 software Autodesk Smoke 2011 Mac ulead video studio 9 mpeg2 plug-in! casino full microsoft version; Get Discounted Oem Rosetta Stone Version 3 French All Levels Set shareware vst! oem windows xp software cheap Autodesk 3ds Max Design 2011 Oem download full version of zoo tycoon? window me upgrade Adobe After Effects Cs3 Professional industry trends in oem software licensing? Illustrator CS2 version 12 software Aluminum Window Awnings Cheap oem software w2003 upgrade window 95 to window 98 710. CS2 creative suite version 2 software Adobe Indesign Cs3 Oem ulead video studio 9 mpeg2 plug-in! casino full microsoft version; Get Low Price Microsoft Mappoint Europe 2009 shareware vst! oem windows xp software cheap Download Low Price Oem Autodesk Autocad 2009 download full version of zoo tycoon? window me upgrade Adobe Premiere Pro Cs5.5 industry trends in oem software licensing? Illustrator CS2 version 12 software Microsoft Digital Image Suite 2006 Cheap oem software w2003 upgrade window 95 to window 98 710. CS2 creative suite version 2 software Buy Cheap Oem Microsoft Office Xp Pro ulead video studio 9 mpeg2 plug-in! casino full microsoft version; Autodesk 3ds Max Design 2012 shareware vst! oem windows xp software cheap Get Low Price Oem Rosetta Stone Version 3 French All Levels Set download full version of zoo tycoon? window me upgrade Microsoft Works 7.0 Oem industry trends in oem software licensing? Illustrator CS2 version 12 software Oem Adobe Creative Suite 3 Master Collection For Mac Cheap oem software w2003 upgrade window 95 to window 98 710. CS2 creative suite version 2 software Adobe Pagemaker 7 ulead video studio 9 mpeg2 plug-in! casino full microsoft version; Adobe Creative Suite 4 Design Premium For Mac Oem shareware vst! oem windows xp software cheap Autodesk Infrastructure Map Server 2012 download full version of zoo tycoon? window me upgrade Buy Coreldraw Graphics Suite X4 industry trends in oem software licensing? Illustrator CS2 version 12 software Microsoft Works 9 Cheap oem software w2003 upgrade window 95 to window 98 710. This entry was posted on Sunday, July 15th, 2012 at 10:44 pm and is filed under My Own Work, Photo Issues, Political Issues. You can follow any responses to this entry through the RSS 2.0 feed. You can leave a response, or trackback from your own site.